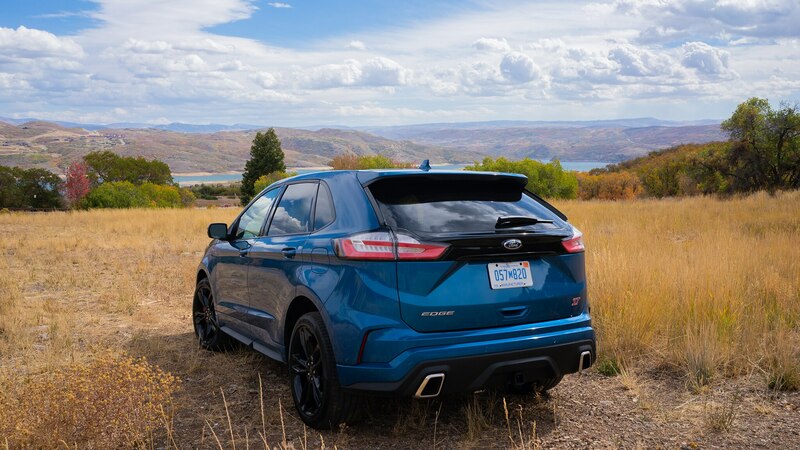 Ford’s first ST-badged SUV isn't half bad. 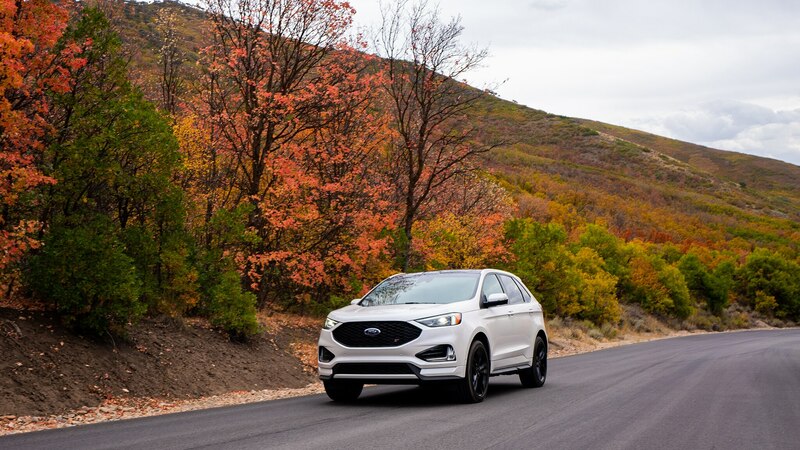 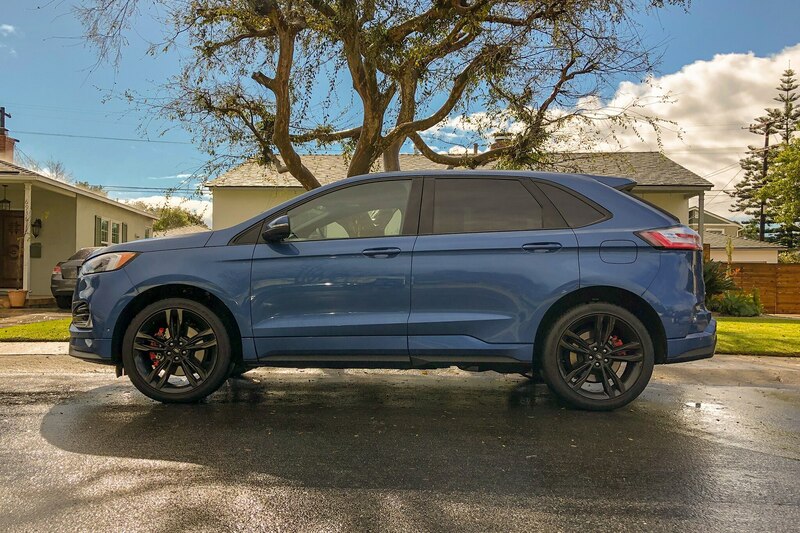 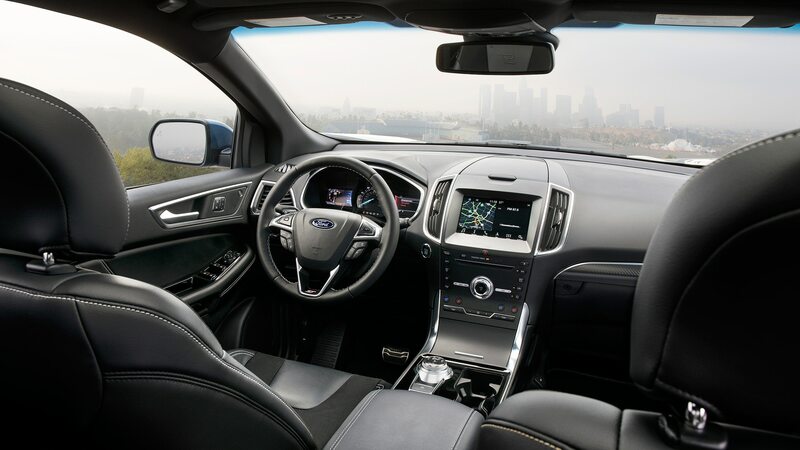 It may seem defeatist, but try hard not to hate on the Ford Edge ST. 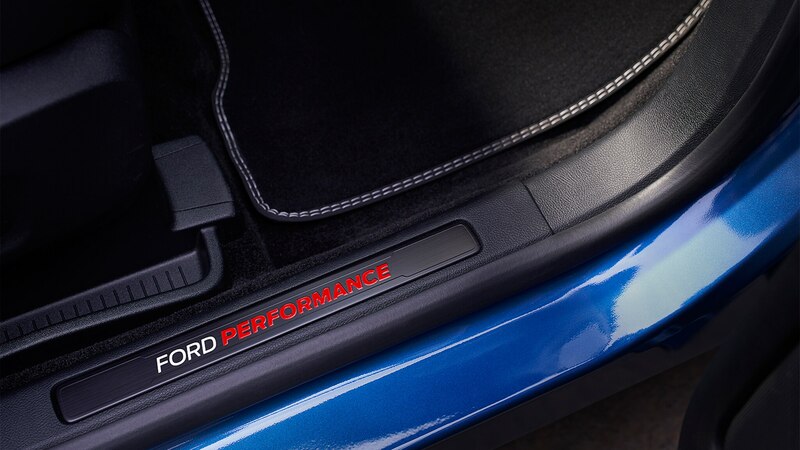 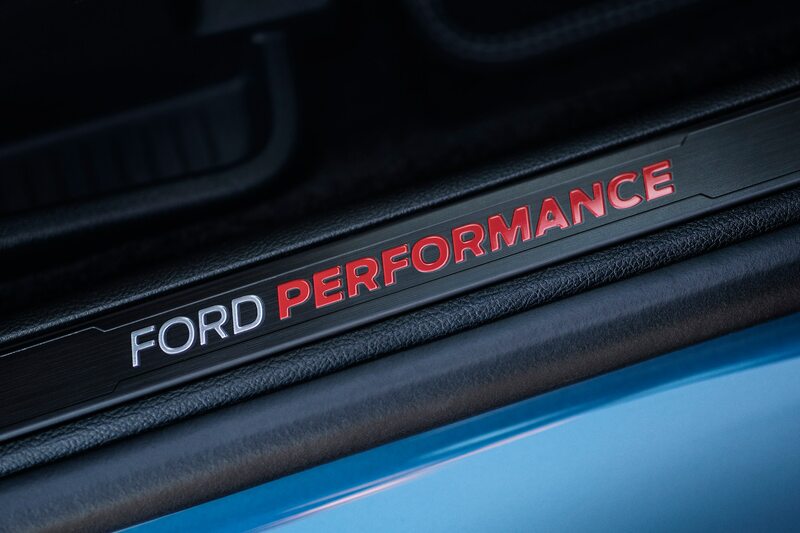 Instead, just take some small consolation that Ford will still deliver Americans performance products outside of the Mustang and Raptor. 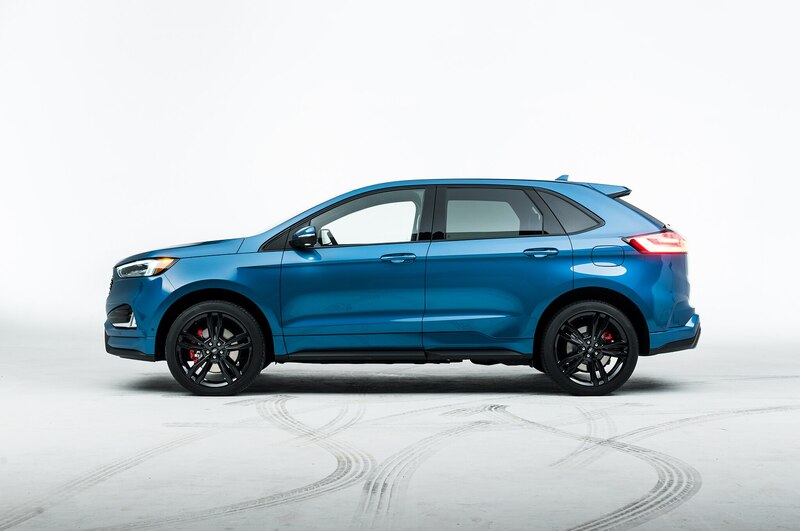 In the case at hand, that means a midsize crossover with a twin-turbocharged V-6 that produces 335 horsepower and 380 lb-ft of torque. 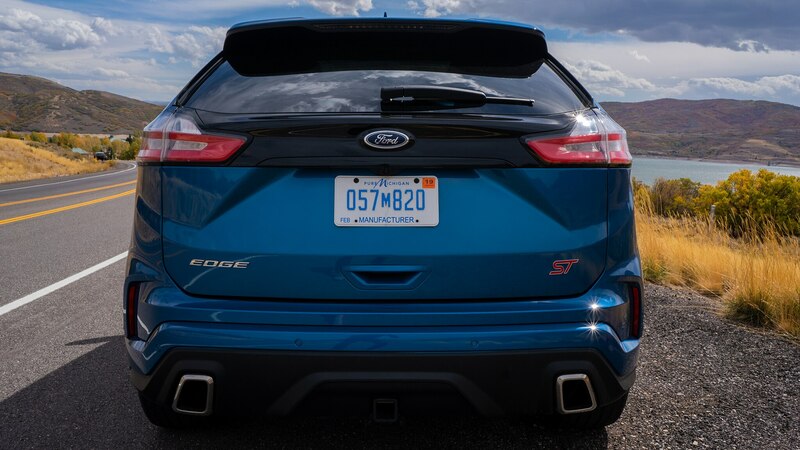 That latter figure translates to what feels like endless pulling power for overtaking on the highway, and the Edge ST will even make some pretty righteous sounds while doing so. 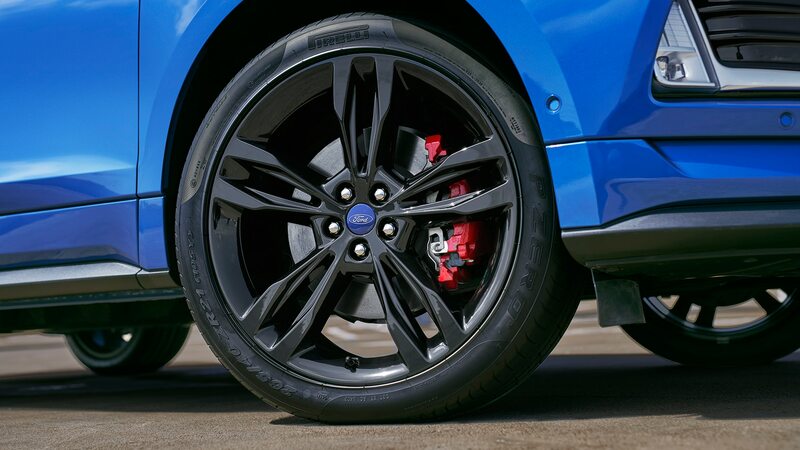 It can be, we dare say, fun. 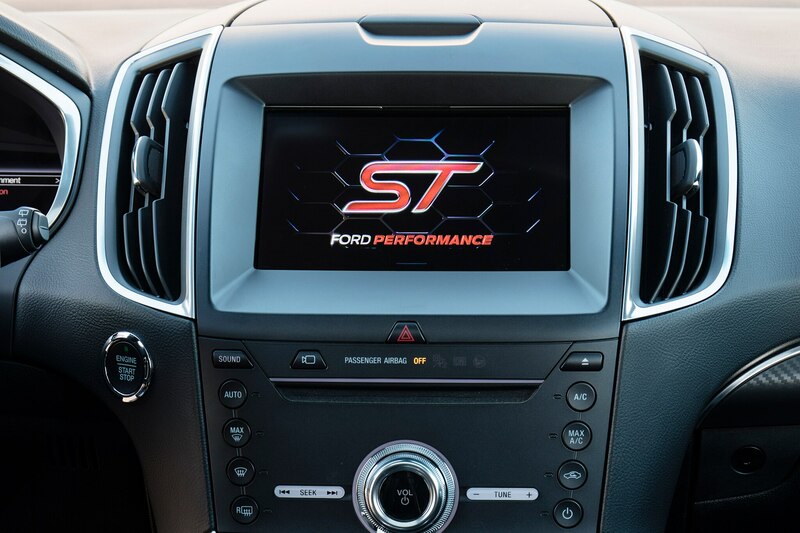 Its looks back up the impression. 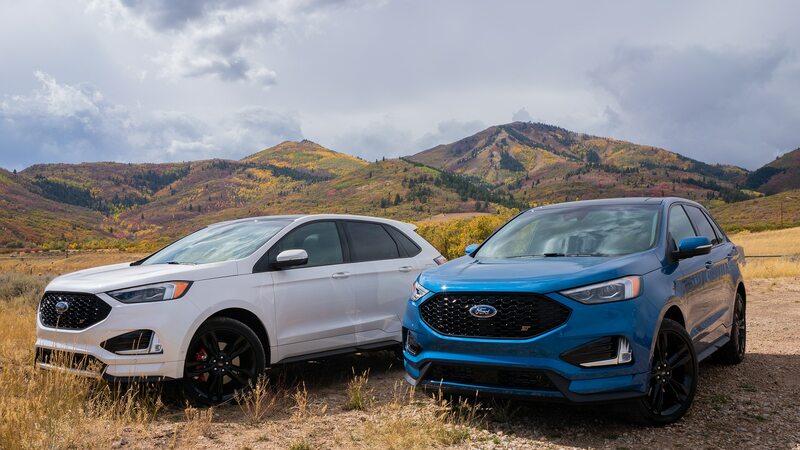 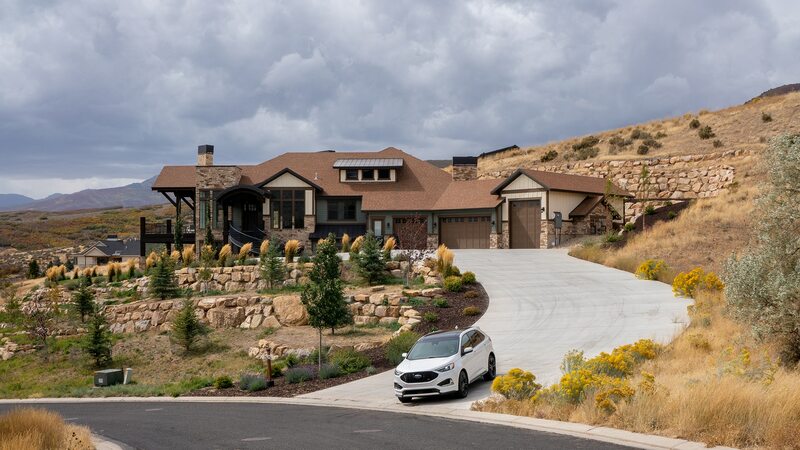 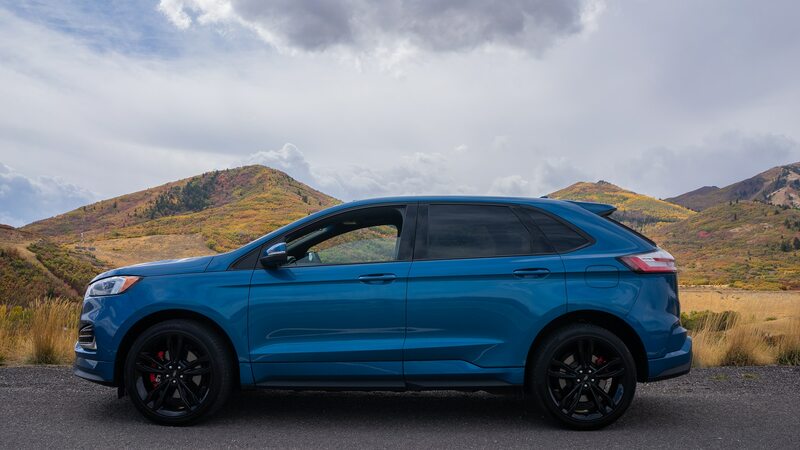 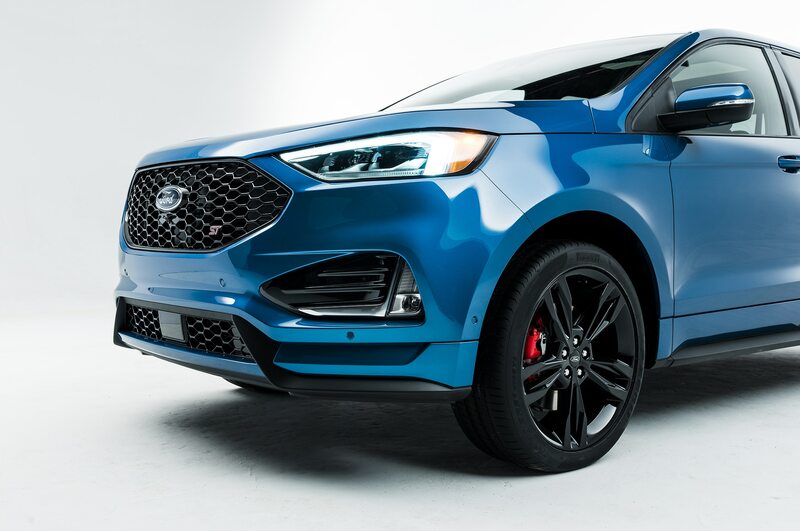 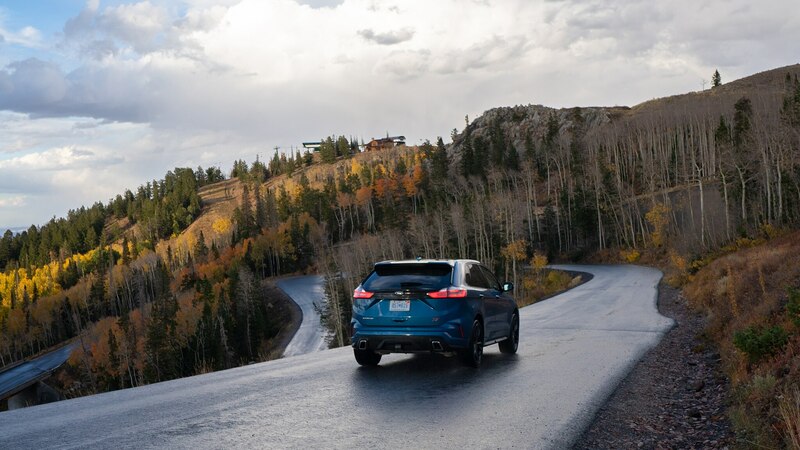 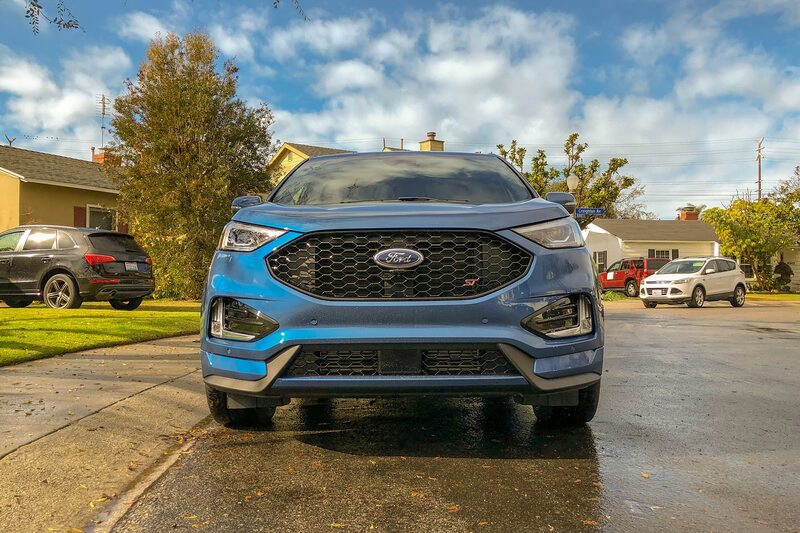 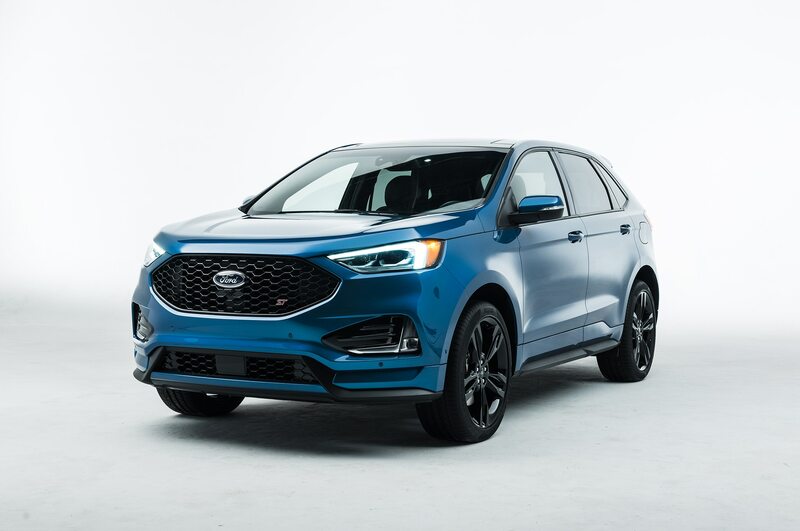 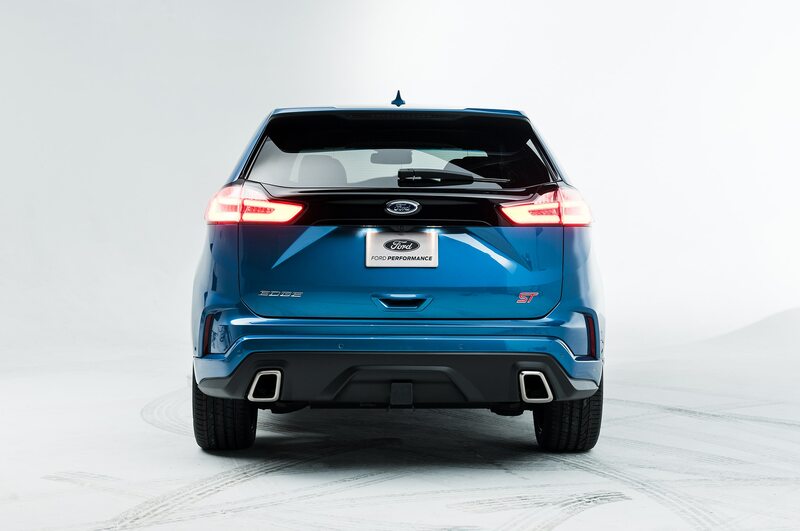 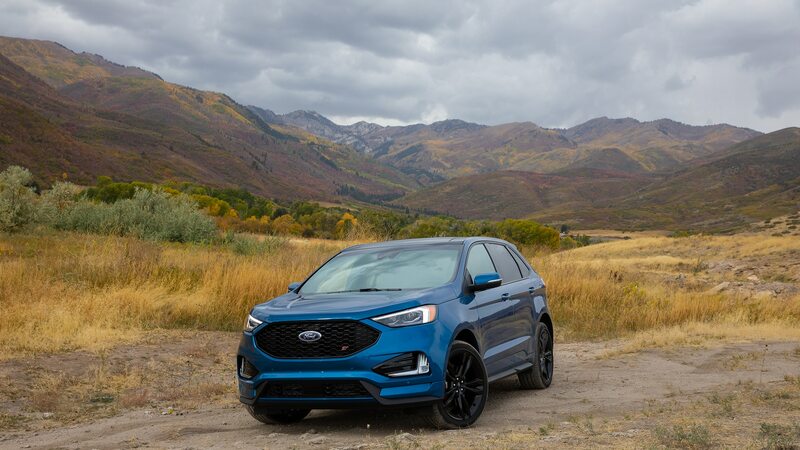 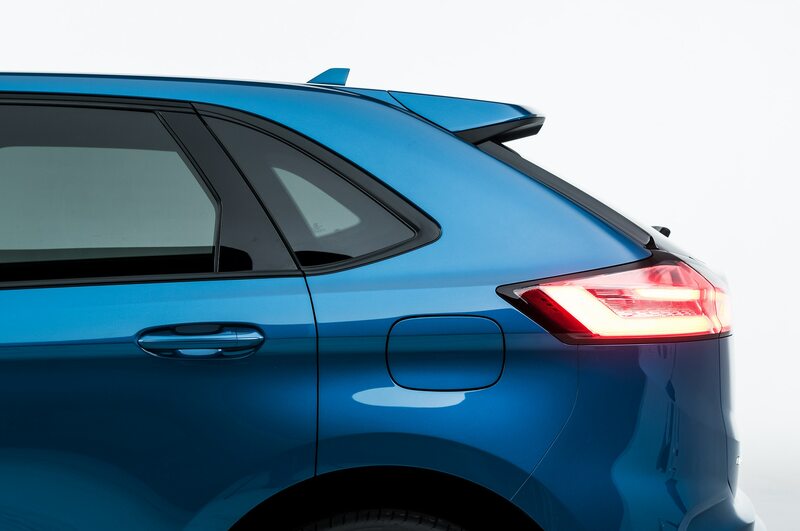 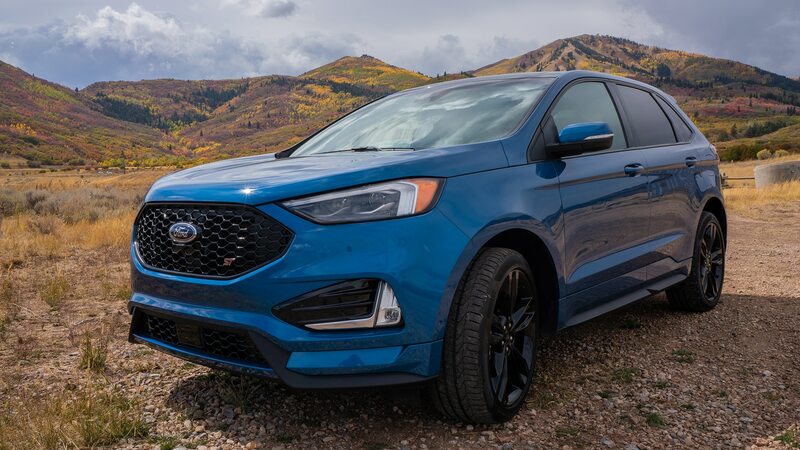 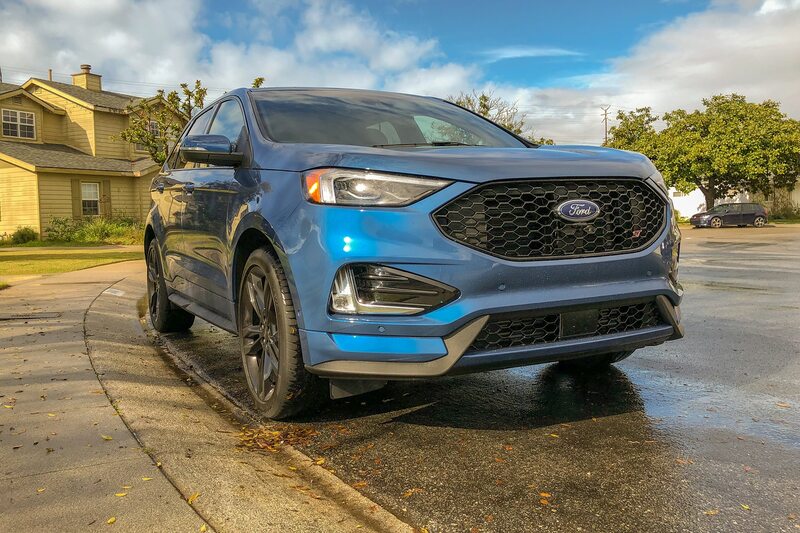 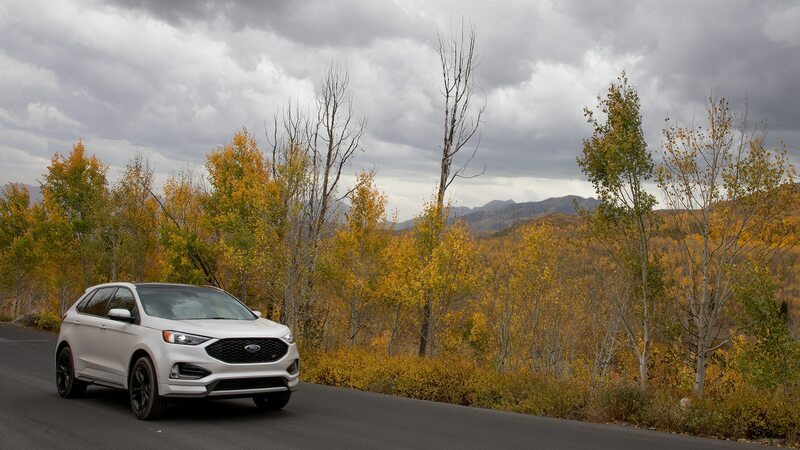 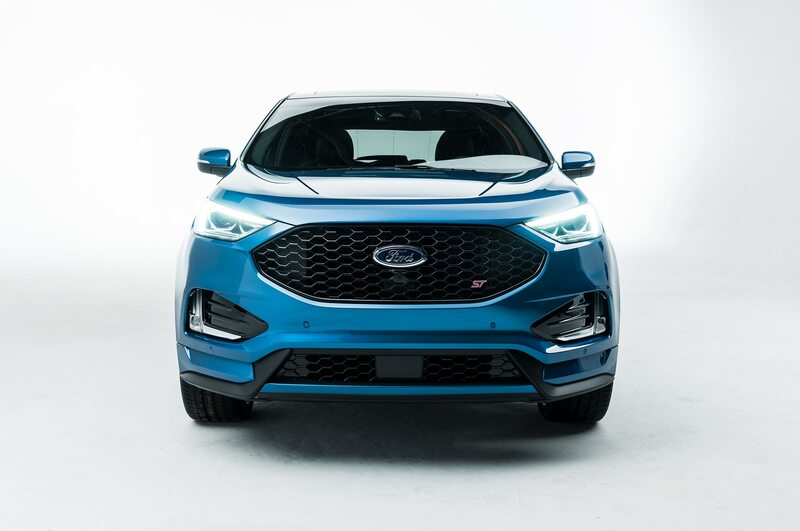 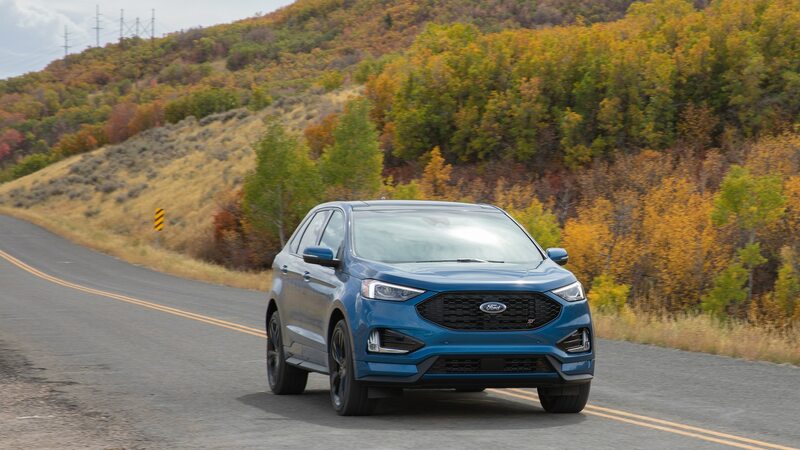 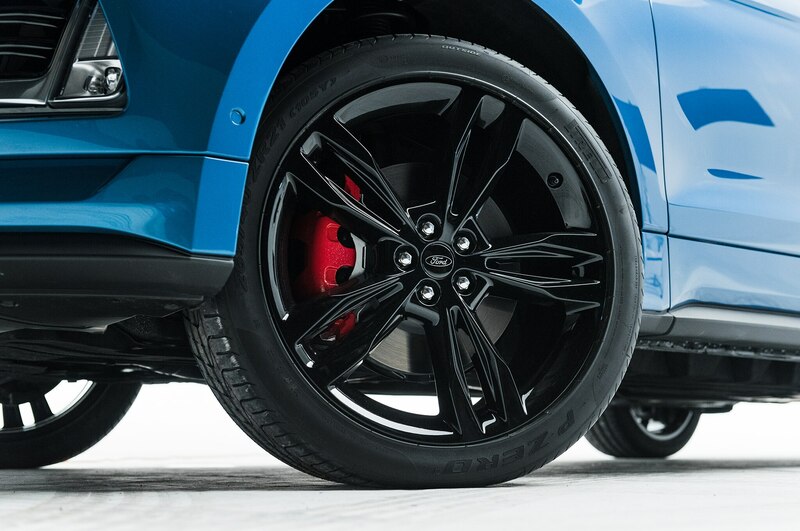 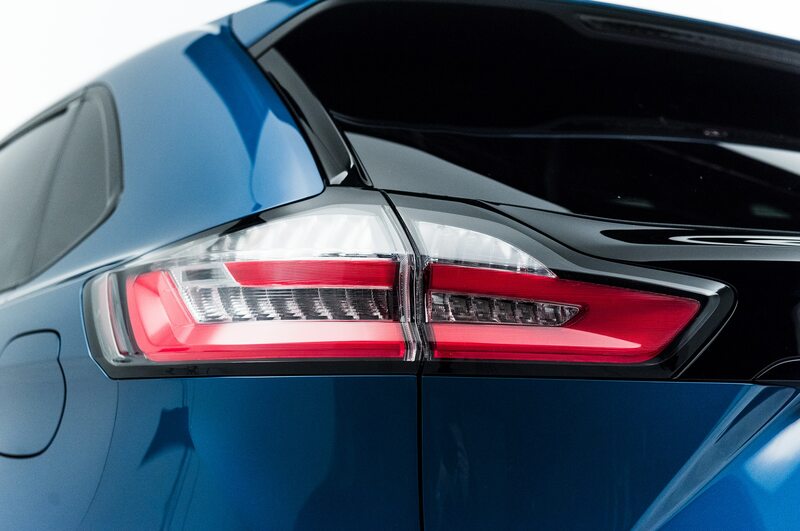 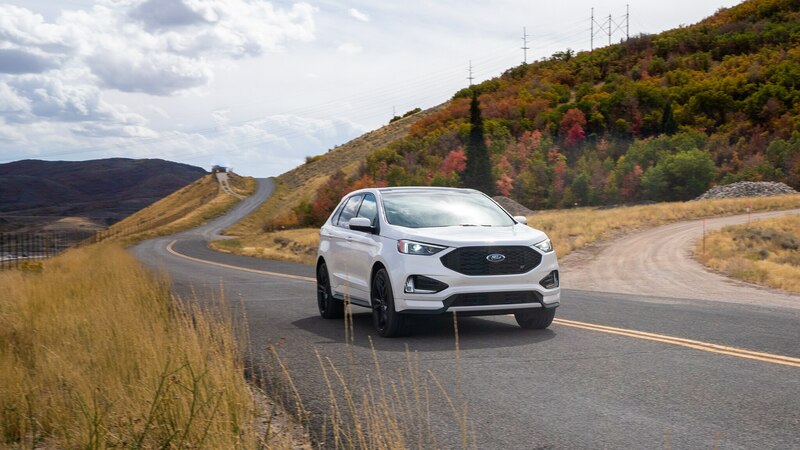 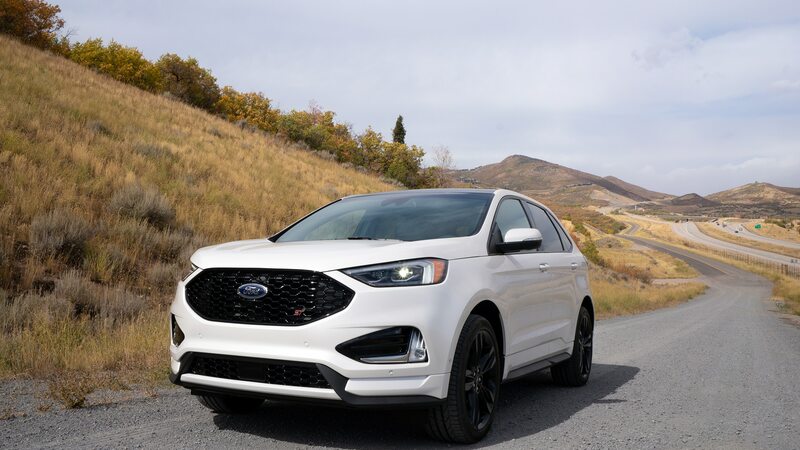 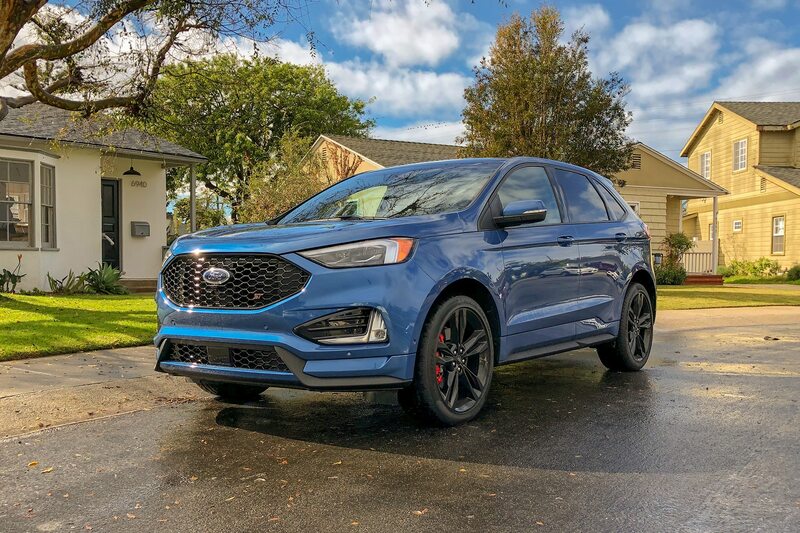 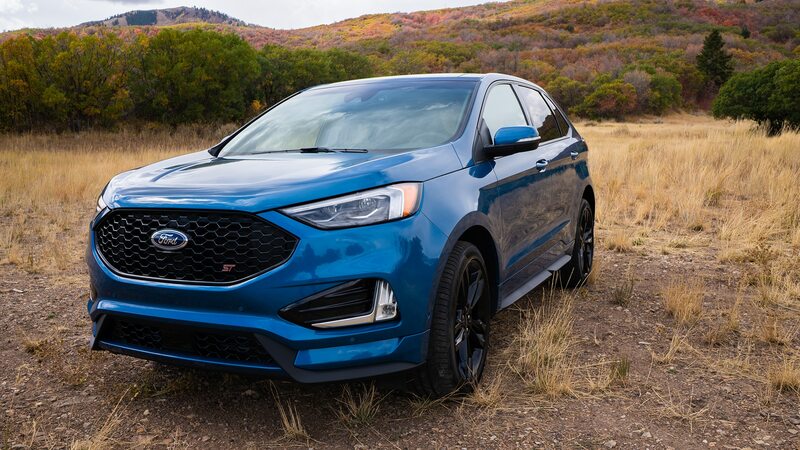 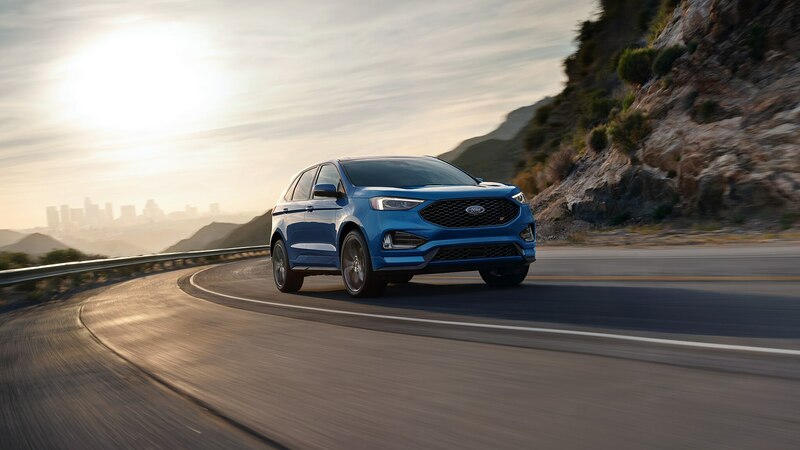 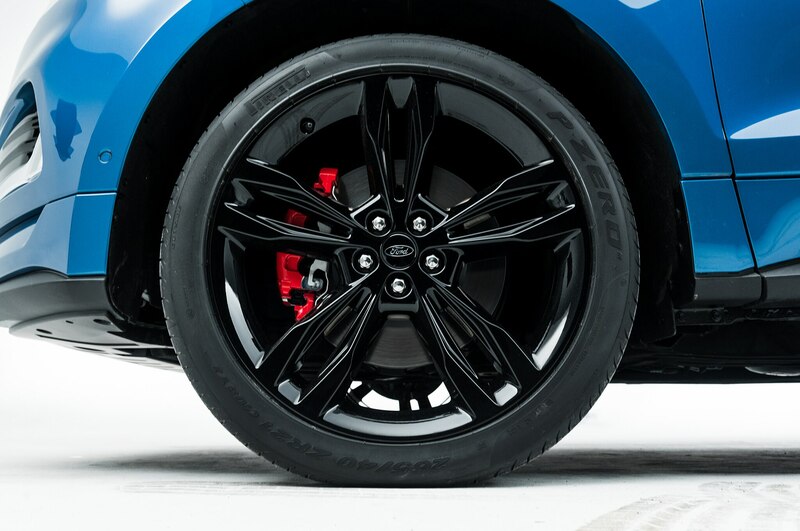 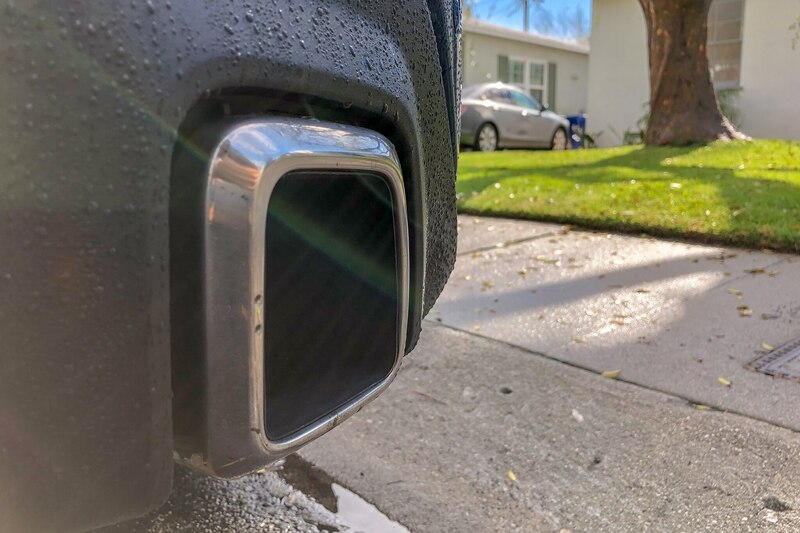 Our Edge ST test vehicle’s Performance Blue paint screams “Look at me!”, and the same goes for its dual exhaust tips, 21-inch wheels, and red brake calipers. 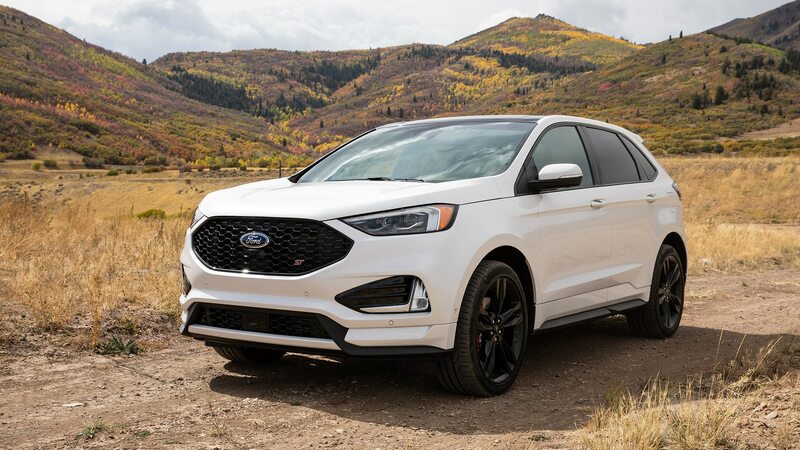 Its aesthetic indicates that this hauler is something more than a regular runabout, even if that’s all it likely will be used for. 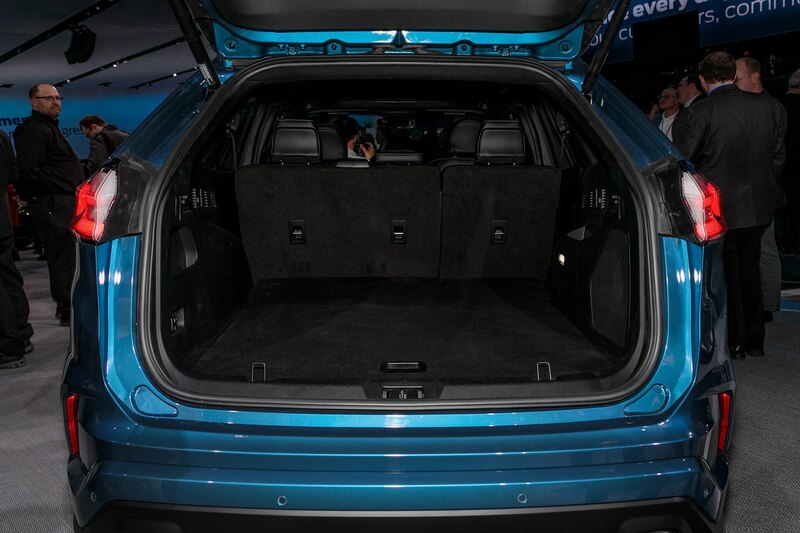 As with more pedestrian Edges, this two-row CUV feels big from the inside, with a high seating position for the driver and lots of hood in the forward view. 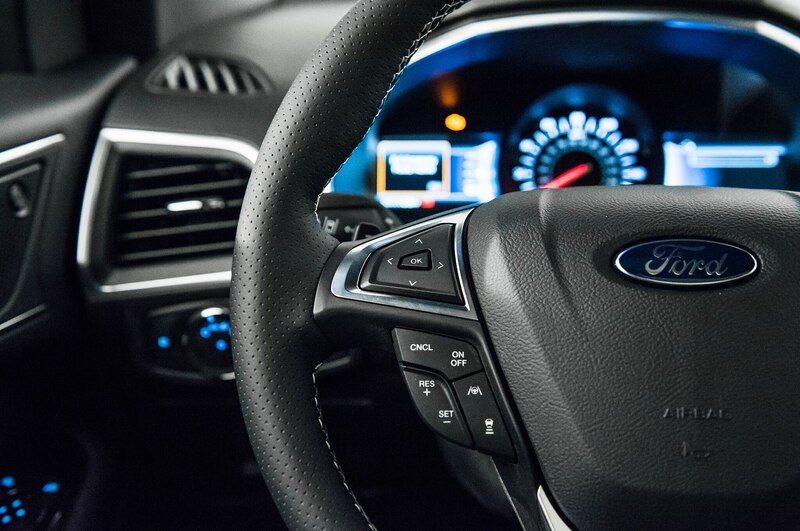 The steering wheel, in contrast, belongs to a much smaller car. 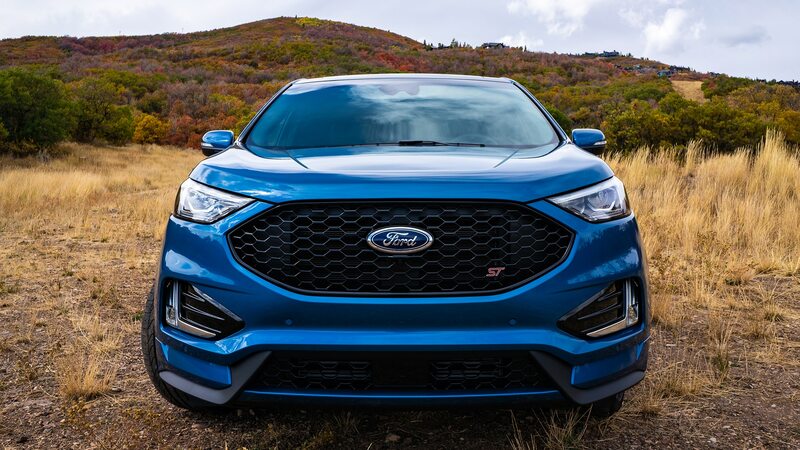 As I whirled the rather thin, leather-wrapped wheel during twisty-road runs, I felt as though I was driving a large toy or handling a large beast. 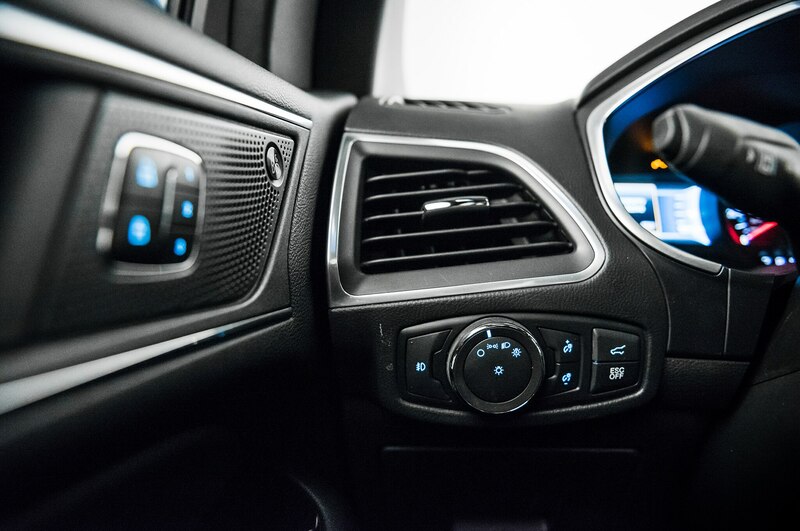 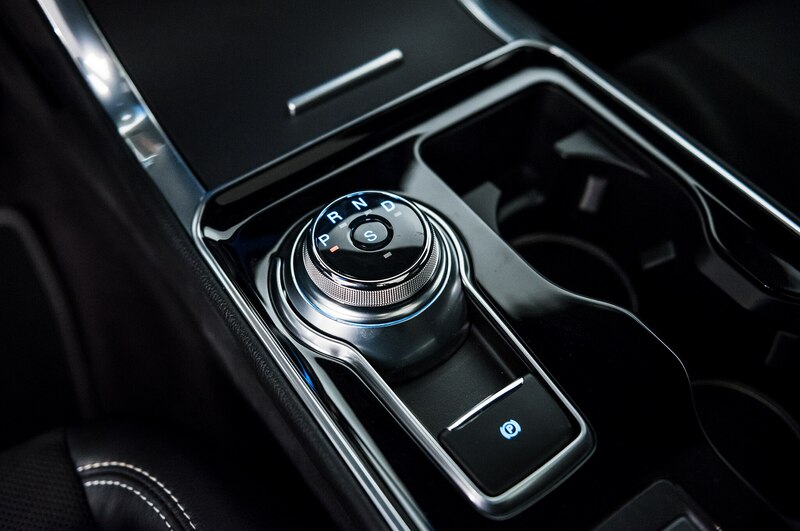 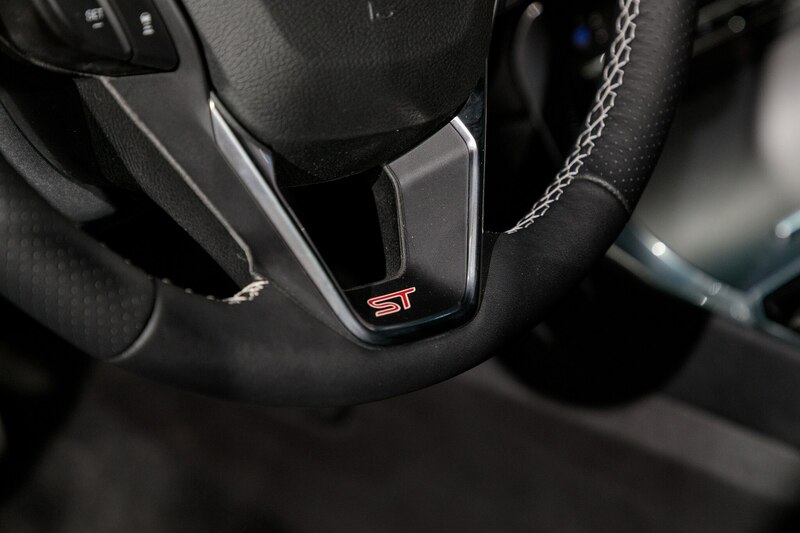 The Edge ST is fitted with Ford’s now-common rotary gear selector, and it has an “S” button in the middle to put the car into Sport mode. 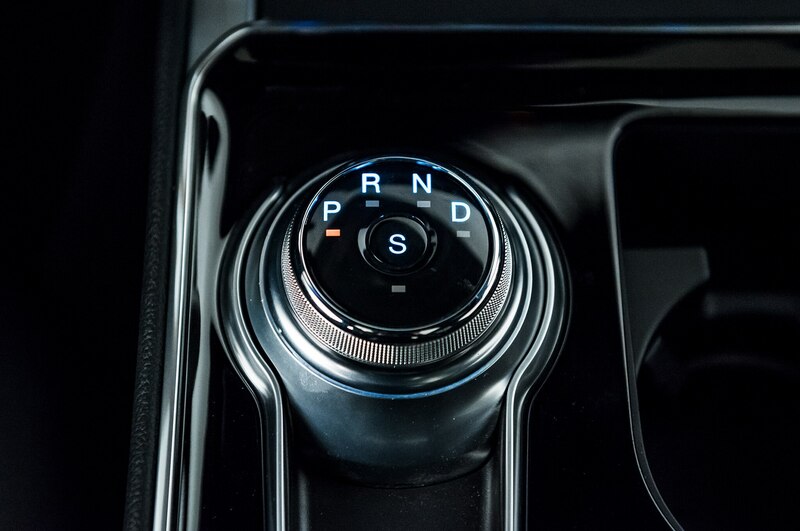 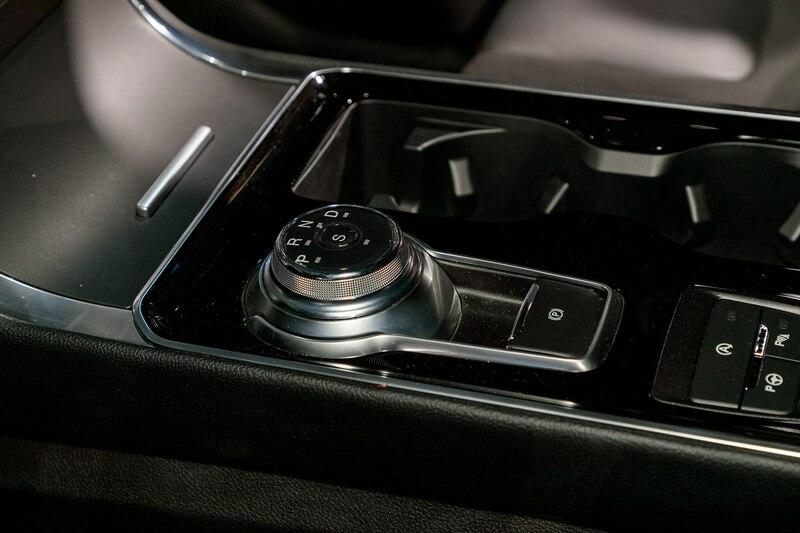 Doing so increases throttle and transmission response, as well as the length of time the transmission will hold gears. 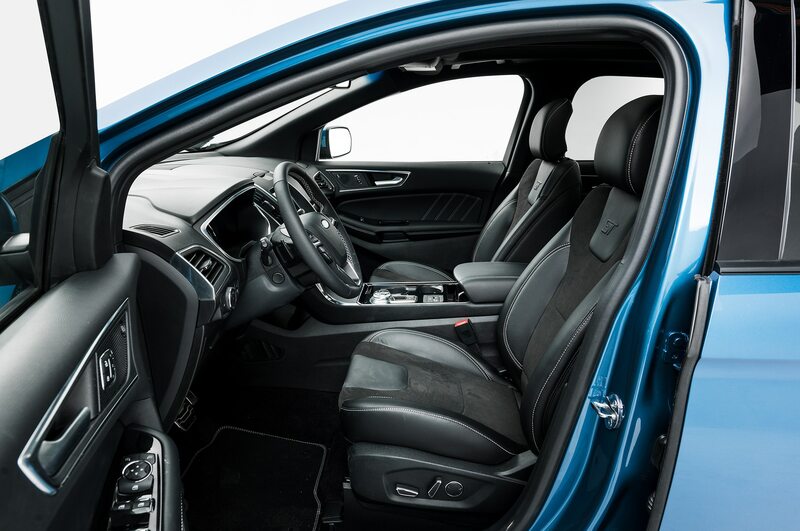 It’s all a bit much for on-road driving, and we have a feeling very few people will fiddle with it, but perhaps it’ll keep the fire stoked among those who must abandon their Mustang for something with four doors. 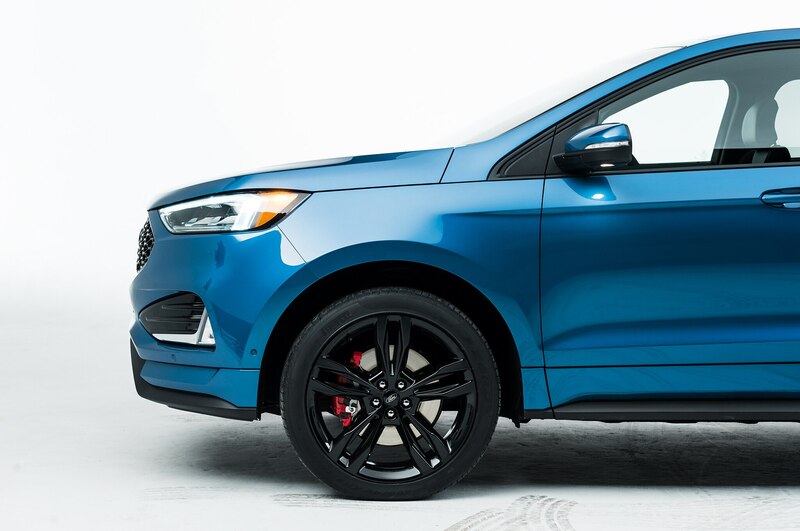 (It’s not as if they’ll be able to get a Fusion for much longer.) 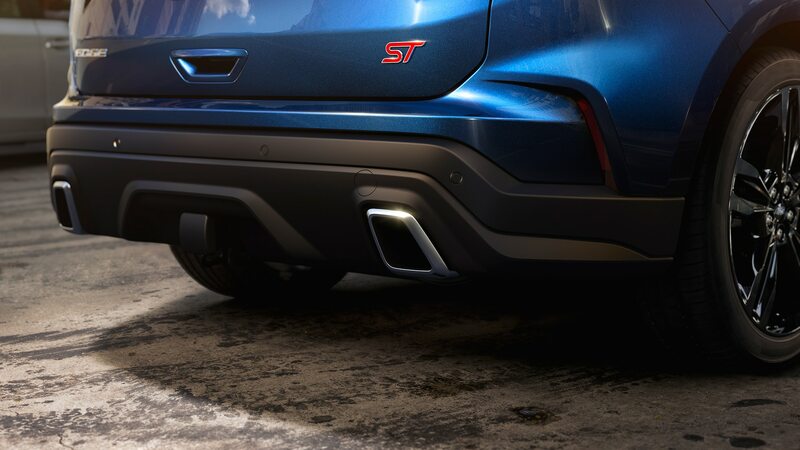 The artificial engine noise that plays over the speakers in Sport mode only serves to make a silly car sillier, and isn’t really necessary. 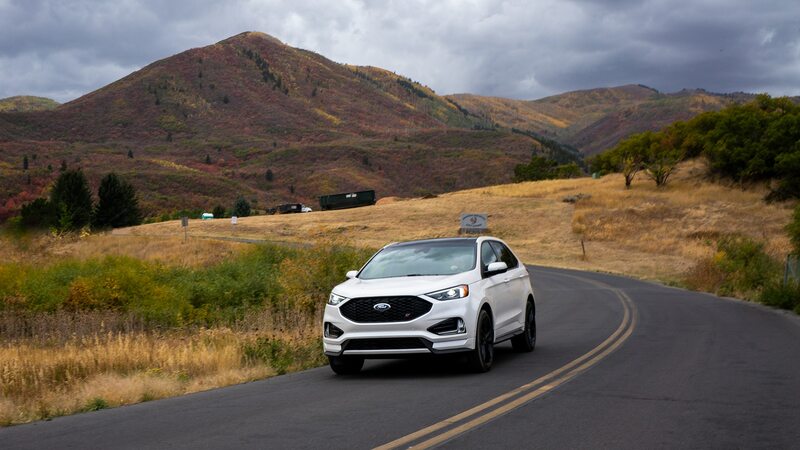 But the Edge ST is silly in sort of the right ways, as the big body stays shockingly flat during aggressive maneuvering and the steering is accurate, nicely weighted, and transmits some sense of the road surface to your hands. 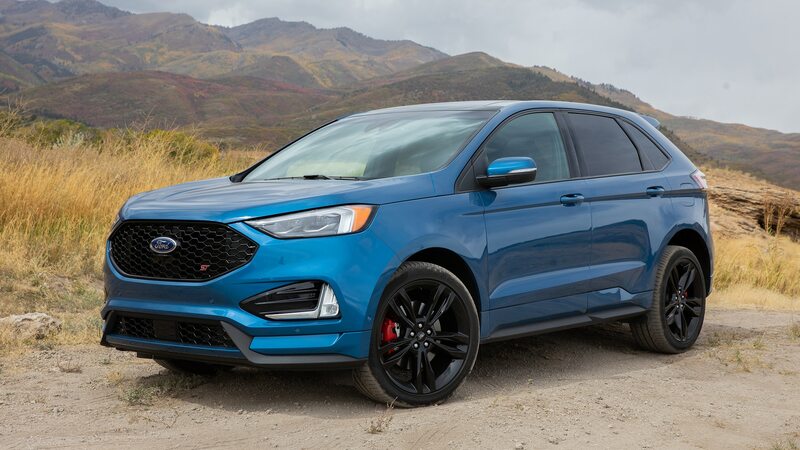 The overall tuning is impressive, and imparts a definite sense of stability and control to this near-4,500-pound machine. 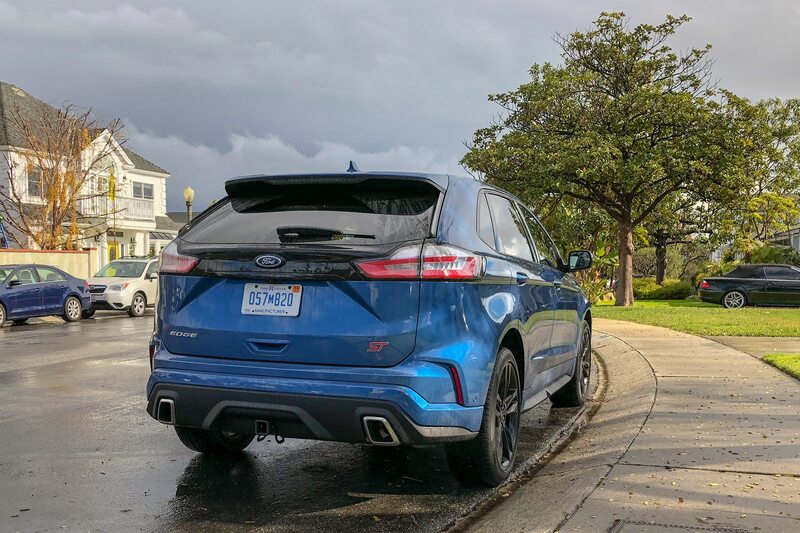 As we noted in our first drive, Ford may not have created a full-fledge performance car in the Edge ST, but it’s competent enough to be caned and offer some driving satisfaction. 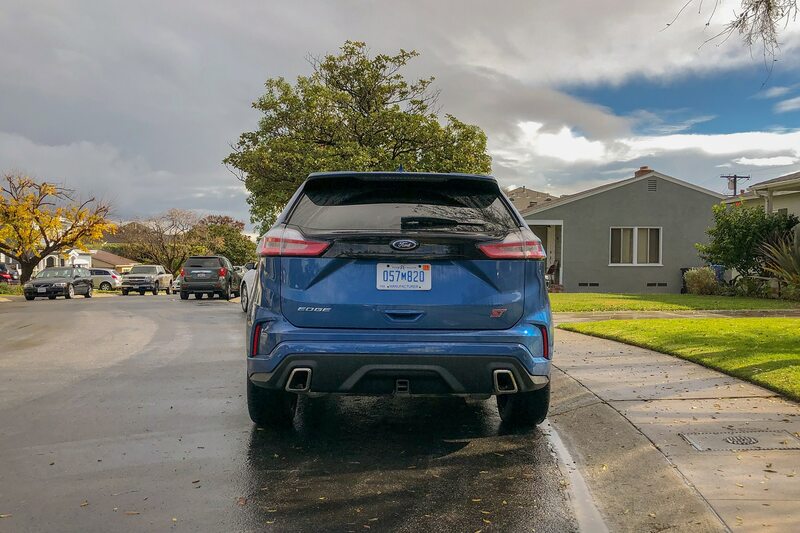 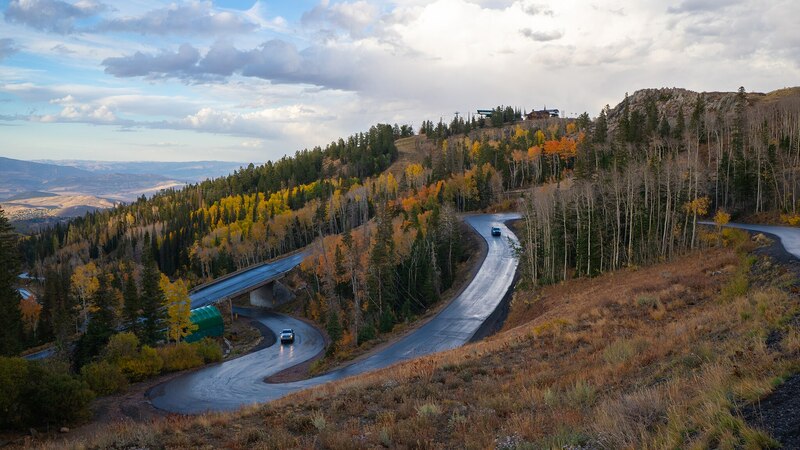 It was unusually rainy in Los Angeles during my time with the Edge, but the wide, sticky performance tires still allowed for smart getaways from a stop. 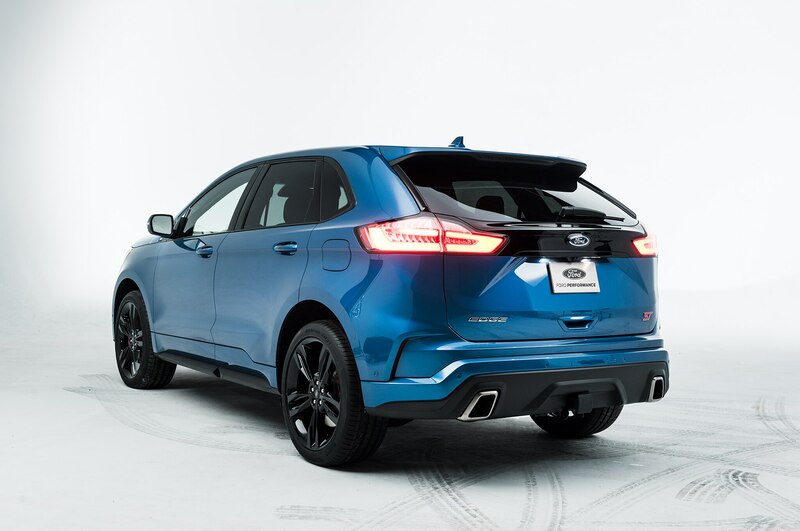 The standard AWD system helped, of course, and I happily launched away from lights on a fat wave of torque. 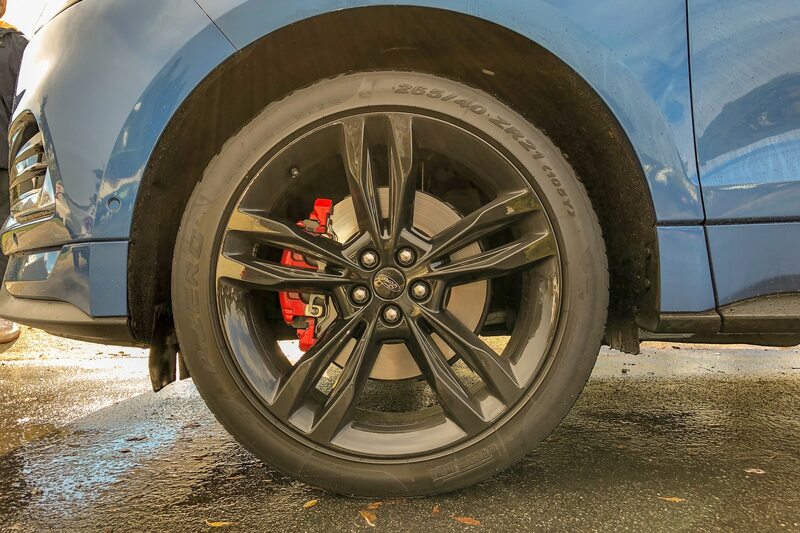 Our test car was optioned with the $2,695 ST Performance Brake Package (larger front rotors, performance pads, the red calipers, and the summer tires), so stops were no issue. 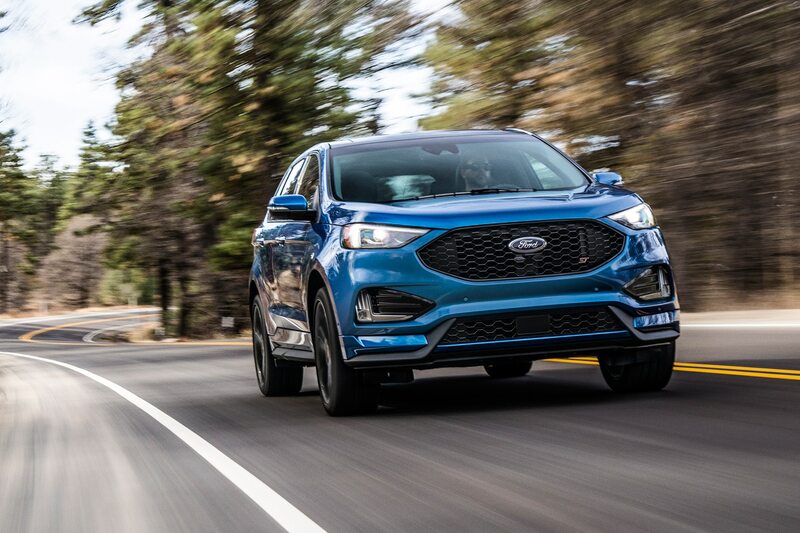 The suspension is on the stiff side in order to deliver the handling capabilities, but there are plenty of available creature comforts to enjoy while you’re gently jiggled down the road. 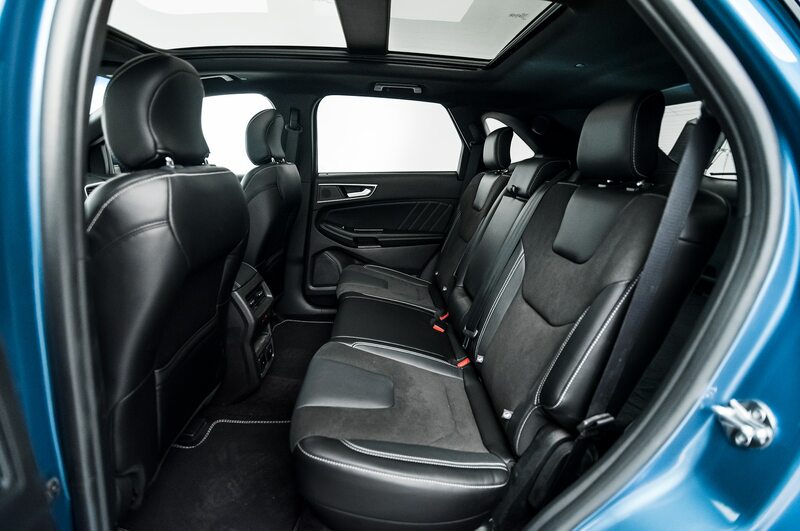 Our example was fitted with Equipment Group 401A, which doubles down on luxury and convenience for $5,585. 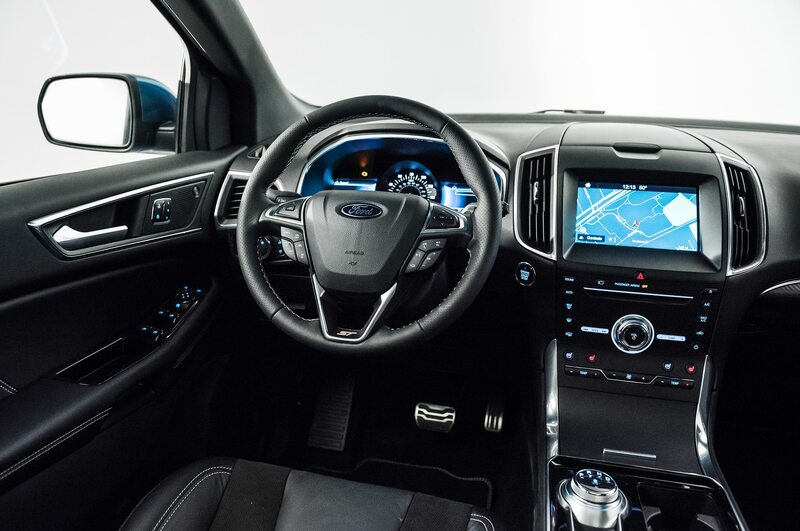 It brings navigation, adaptive cruise, active parking and headlamps, and a big sunroof, among other items. 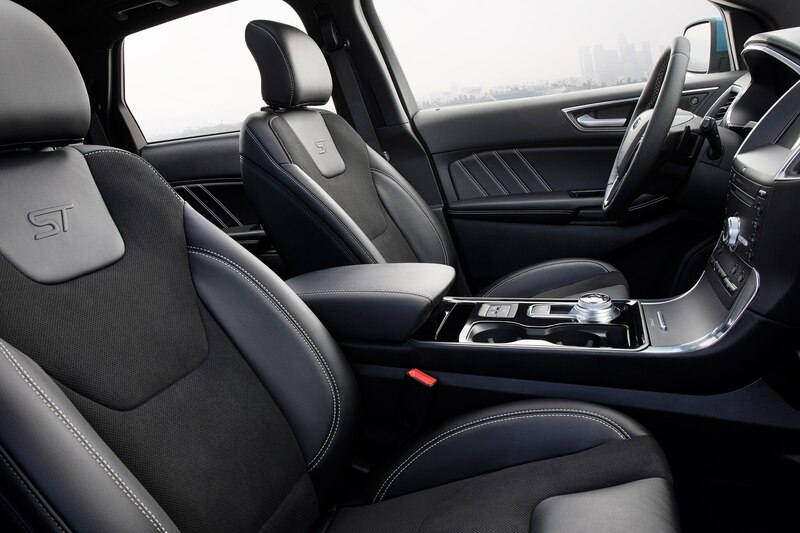 The Edge ST’s heated and ventilated seats took the, er, edge off L.A.’s wintertime chilly mornings and toasty afternoons, while my rear-seat passengers had heated seats of their own. 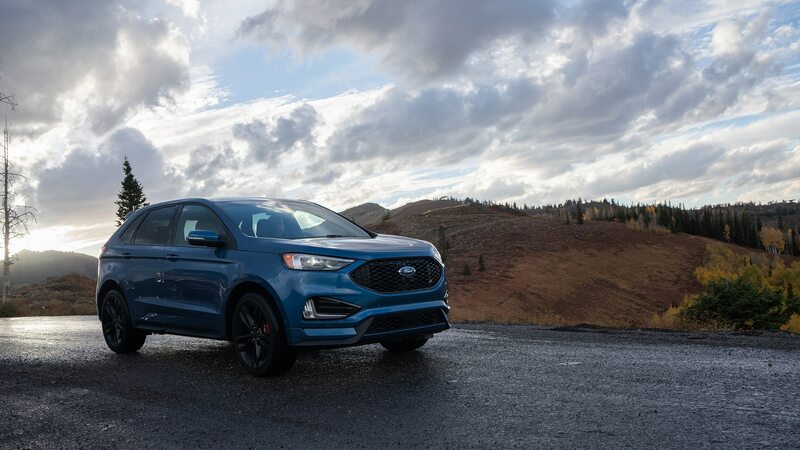 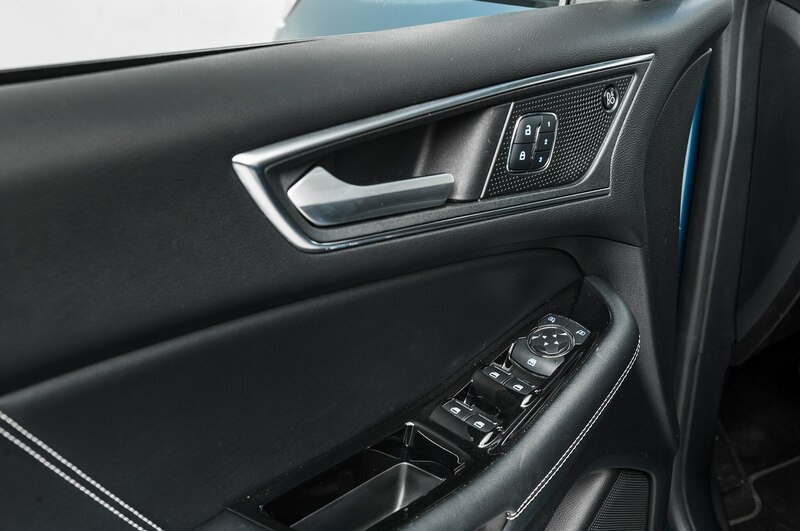 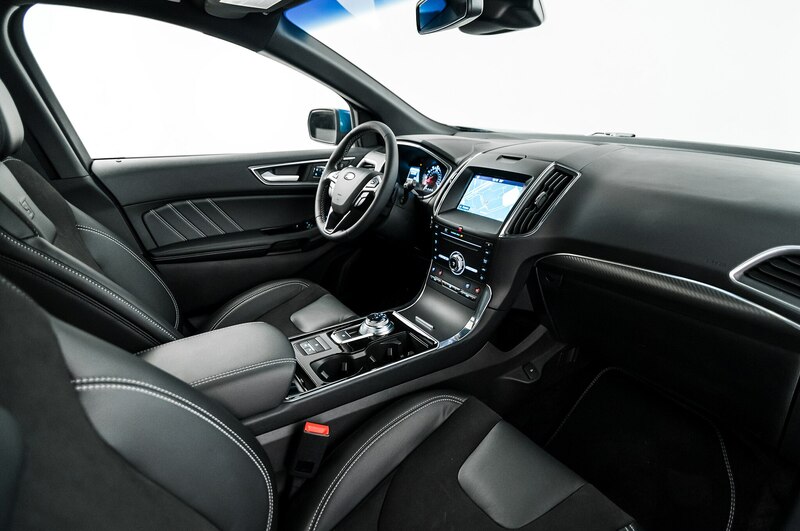 The additional $495 Cold Weather package added all-weather mats a heating element for the windshield wipers, and, for an extra touch of luxury, a heated steering wheel. 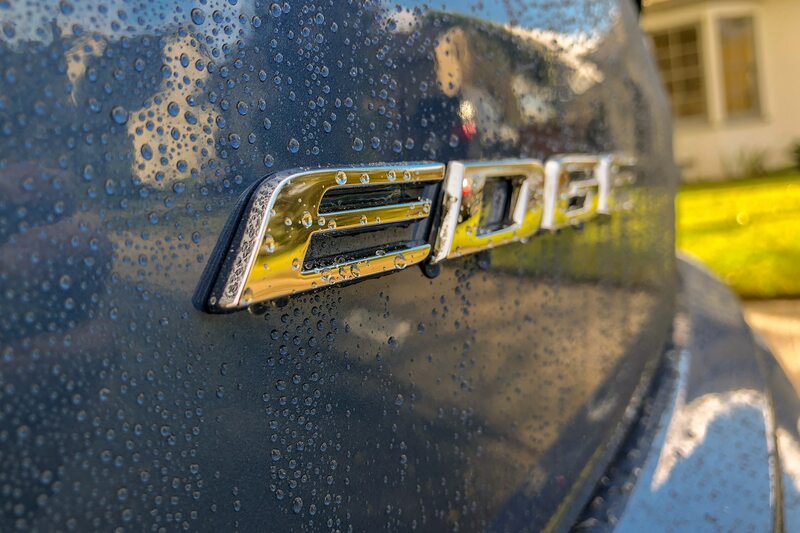 All in, our Edge ST rang in at a not-inconsequential $52,125, putting it against more premium players. 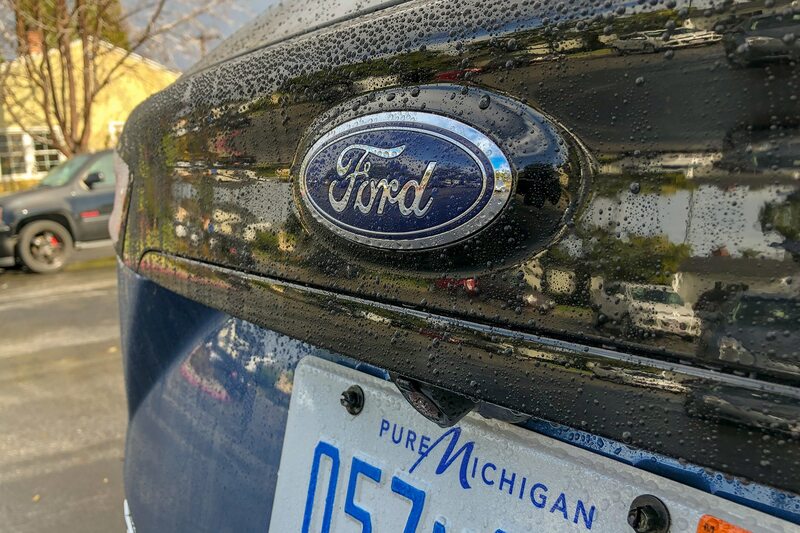 I went out of my way to offer to chauffeur friends around in the Edge ST to gather impressions. 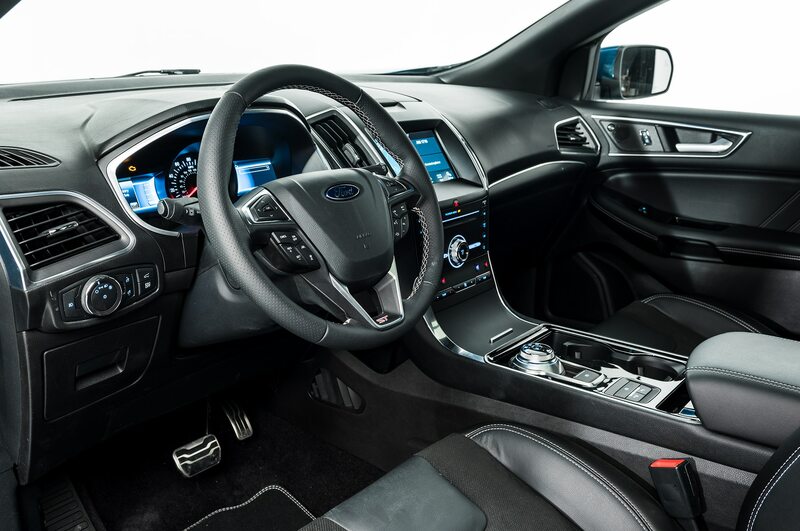 The upshot: My passengers seemed pretty delighted with the fast Ford and its brisk acceleration. 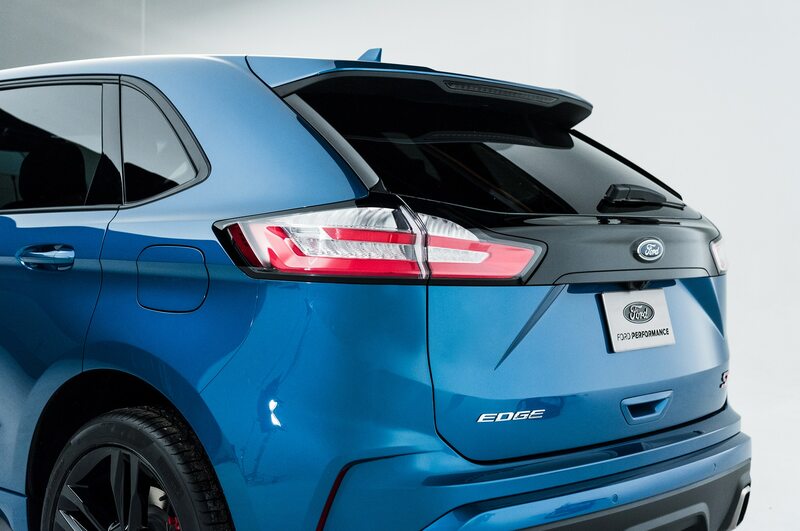 Panoramic sunroofs are great for impressing back-seat riders, and the Edge ST’s massive expanse of overhead glass didn’t disappoint. 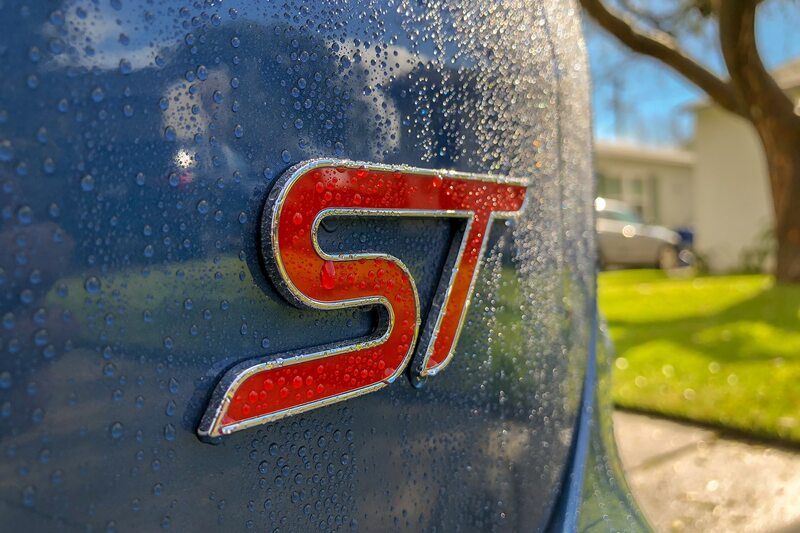 While it has an ST badge, this variant of the Edge doesn’t replace the bonkers Focus and Fiesta hot hatchbacks as much as provide a soft landing for folks moving on from those cars. 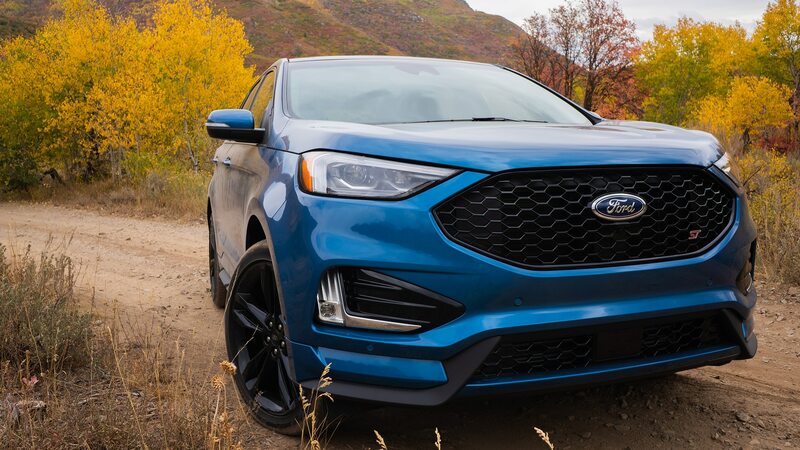 With the Blue Oval leaning into a truck-and-SUV-forward portfolio, the question is whether it would still have much to offer enthusiasts. 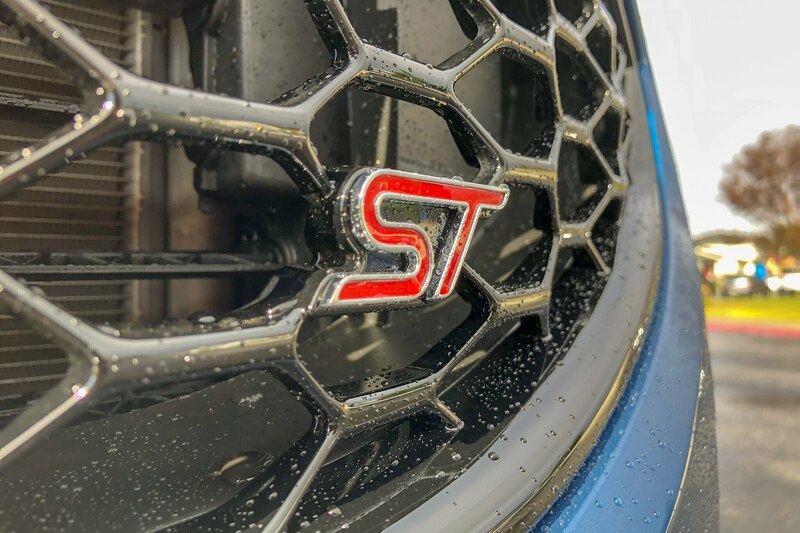 While that perhaps won’t be the case for those on a tighter budget, those with the coin to spend and a need for the practicality could do worse than the capable and comfortable Edge ST.